And she jokes while the date didn’t work out, it was love at first sight for her and burlesque. A love that has grown for well over a decade as she has performed and taught around the world. Having a bit of performing history, La Viola Vixen took up Burlesque lessons and was found to be a bit of a natural. In fact while she was still learning she became a teacher and has never looked back. But La Viola Vixen never started burlesque thinking she would one day travel the world and live in Berlin as a Burlesque superstar! Instead, like so many men and women, burlesque was something she enjoyed, something to help build her confidence and meet like minded people. But her career took off. And these days she’s known as the ‘Queen of the Quiver’ having performed around Australia, Europe and America. Having started the Bombshell Burlesque Academy with Kat Creasy (who you can meet back in our first episode) La Viola Vixen took her teaching and performance to Berlin. She spent her first few years with her feet barely touching the ground as she travelled around Europe performing. If you live or have been to Australia you’ll know everything is so far away from each other. When an Aussie heads to Europe we are amazed that you can get to another country in just a couple of hours! So it was burlesque performances in Rome, Sweden as well as America and right around the world. But travelling is exhausting and eventually a home base was set up in Berlin with the launch of the Shimmy Shake Berlin Burlesque School. And from there it was regular events in Berlin, launching the Berlin Burlesque Week in 2016 and travelling to perform a couple of weeks a month. It was so great to catch up with La Viola Vixen for episode 21 of the podcast. To learn about the grungy, almost historic feeling burlesque scene in Berlin. But also be able to share the news that in September and October of 2017 La Viola Vixen will be headlining and touring with the Australian Burlesque Festival. Wherever you are in the world, keep an eye on La Viola Vixen’s Facebook page for her latest shows and events. 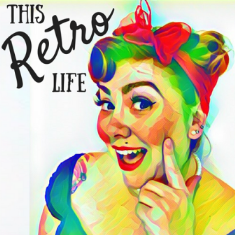 And subscribe to our podcast to not only hear our chat with La Viola Vixen but to catch up on our conversations with so many other fabulous vintage and retro guys and dolls!